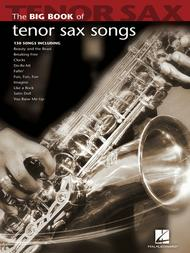 Big Book of Tenor Sax Songs composed by Various. For Tenor Saxophone. Instrumental Folio. Softcover. 144 pages. Published by Hal Leonard (HL.842210).ISBN 1423426665. 9x12 inches.Instrumentalists will love these collections of 130 popular solos, including: Another One Bites the Dust • Any Dream Will Do • Bad Day • Beauty and the Beast • Breaking Free • Clocks • Edelweiss • God Bless the U.S.A. • Heart and Soul • I Will Remember You • Imagine • Na Na Hey Hey Kiss Him Goodbye • Satin Doll • United We Stand • You Raise Me Up • and more.